I was telling Tammy from Mata Beer the other week at Auckland GABS 2016 (#namedropper) that Best Beer HQ has become something of a Garage Project fan blog. Case and point, this is the sixth beer by the Wellington brewery that we’ve reviewed here. For those of you not keeping count, of the other five beers featured on this NZ beer blog only one didn’t get a big tick of approval (I thought Garage Project’s White Mischief peach sour was obnoxious, to be frank). So the odds are good that’ll we’ll approve of Hapi Daze Pacific Pale Ale, then. Blurb on the can: Hapi, the Maori word for hop, inspires this truly Pacific pale ale. Brewed with New Zealand barley and the best of the Kiwi hop harvest, Motueka, Wai-iti, Riwaka and Nelson Sauvin. Assertively hoppy – exceptionally drinkable. Tastes like: I should be at a barbecue at the family bach in the Far North of New Zealand; not sitting on my couch at home because it’s too cold and wet to go outside. Even drinking it straight from the can, Hapi Daze boasts a remarkably strong aroma of hops, which taste as though they were just picked yesterday. It smacks of mango, papaya, and passion fruit, but these tropical fruity flavours aren’t so dominant that you’d confuse this beer for anything other than a very drinkable, very sessionable pale ale. 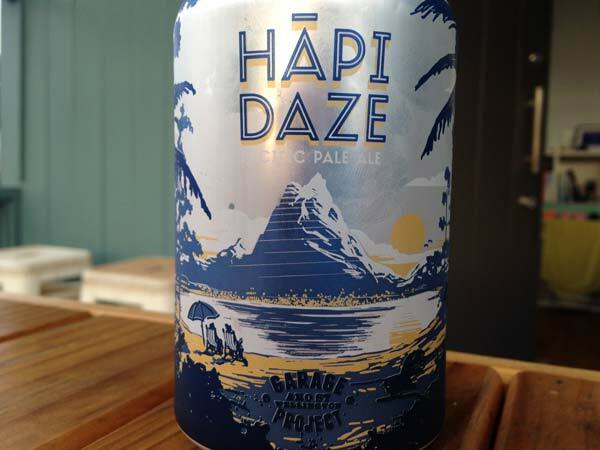 I appreciate the Kiwi-ness of Hapi Daze, which is just different enough from the horde of crafty pale ales on the market right now to keep me interested. The verdict: Was there ever any doubt? Hapi Daze is yet another goody from the Garage Project. Movie/beer pairing: Dazed and Confused. For no reason other than I love this movie and it has the word ‘daze’ in its title. Check out the trailer below.